From Carrabassett Valley take the Carriage road located at Valley Crossing. Drive the Carriage road for about 5 miles to the end. Take a left and you’ll soon see a large sign marking Bigelow Preserve. Just past the sign you’ll come to a fork in the road, bear left here. Almost immediately on your right there is a parking area as well as access to Flagstaff lake. Park your car here. Hike out of the parking lot and continue up the road (following white blazes) the trail is on your left. Follow the white blazes to the summit. Other options: This can be made into an excellent overnight or loop hike as well. Once at the summit of Little Bigelow continue along the white blazed trail until you reach Safford Notch (tent platforms, water source and privy available). From here take the blue blazed Safford Brook Trail down to the road you began your hike on… Hike this backwards to enjoy a stay at the Little Bigelow Lean-to..
Nancy Marshall: Pro Tour; ski racing for $ revision is exciting to watch for all ages! 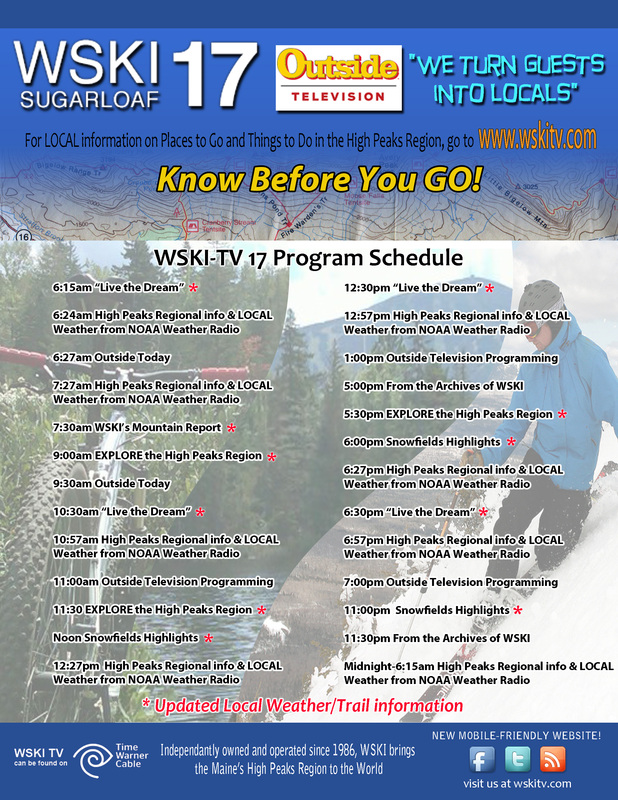 Independently owned & operated since 1986, WSKI TV brings the Maine High Peaks region to the world. Copyright © 2019 Snowfields Productions. Hosting & Customization provided by Sephone Interactive Media.